Here, we, go! Nokia finally unveiled what we were all waiting for at its high throttle event in New York City, with a lot of pizzazz, style, and special effects of course – something that’s befitting of a smartphone that’s meant to be the company’s flagship for this year. 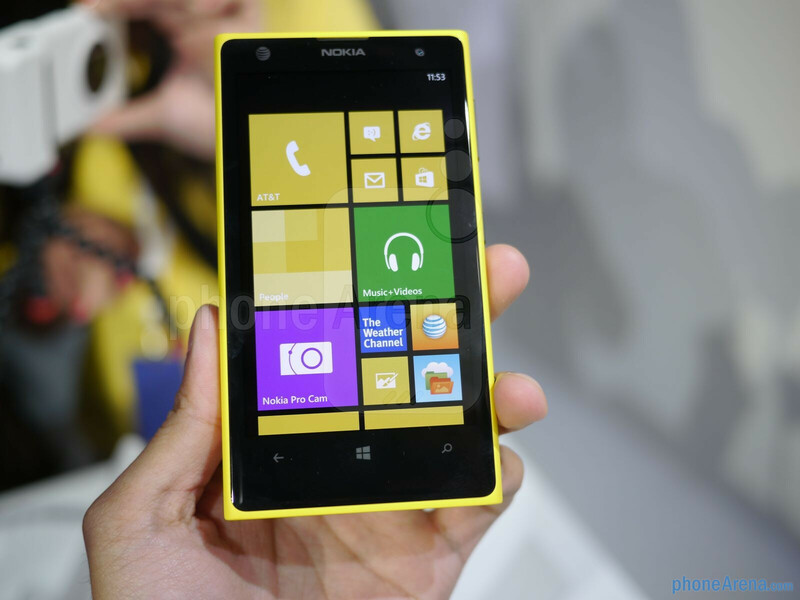 Diving right into it, the Nokia Lumia 1020 faces a lot of stiff competition in the landscape, a growing stable of devices that’s constantly redefining the spectrum. However, as they’ve clearly detailed at the beginning of its fancy event, we’re a society that’s bent on capturing every living experience through photos and videos. 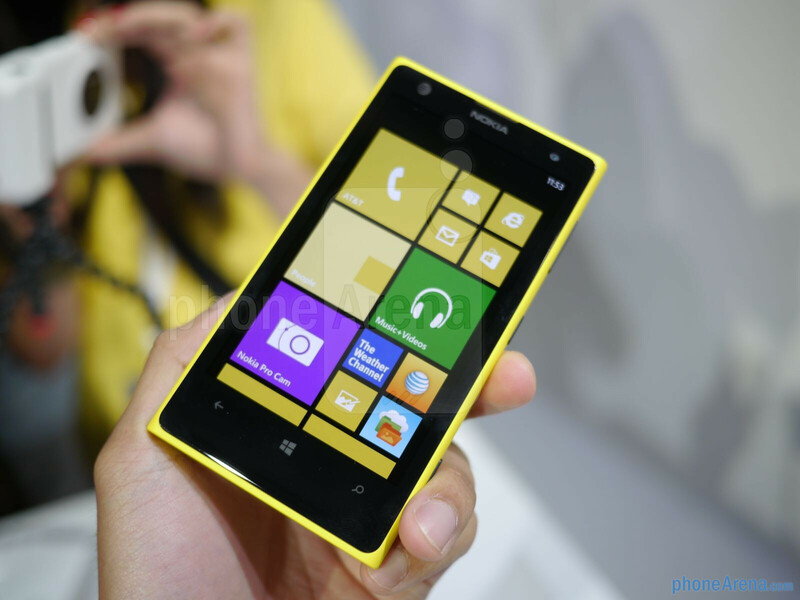 With that in mind, that’s exactly what the Nokia Lumia 1020 intends to excel in – thanks mainly to its mind-boggling 41-megapixel PureView camera, which carries along an insane arsenal of high-tech hardware and wizardry to essentially make it the most powerful camera to grace a smartphone. Most people probably wouldn’t fancy over its camera specs, but for those who are serious about it, they’ll be astounded by how much more comprehensive it is from its nearest competitor. As much as there’s big hype around its camera taking prowess, it still needs to be riding on high gear in order to stand a chance in a market that’s dominated by the likes of the iPhone 5, Samsung Galaxy S4, and HTC One. The harsher critics might view this as yet another do-or-die scenario, seeing that Nokia’s presence amidst the smartphone landscape is still filled with uncertainty. You’d think that a new flagship device like this would be graced with a new display, one that would normally be associated with any successive device – like a bigger and higher resolution screen. Sadly, that’s not the case here, as the Lumia 1020 is sporting a display that is nearly the same as the one used by the Lumia 920 from last year. To be more specific, it’s a 4.5-inch 768 x 1280 (WXGA) PureMotion HD+ AMOLED, which on paper is almost identical to its elder sibling (save for it being an AMOLED panel this time). Certainly, we’re a little bummed by that revelation of course, especially when we’re talking about a device that’s trying to compete against others with 1080p resolution, but it’s nonetheless good enough for most things. Seeing that it’s based on AMOLED technology, you get that dark black color without any milky tones to it, and saturated colors that undoubtedly splash on that wow factor from afar. From what we notice, the screen’s clarity is maintained at all viewing angles too. And just like before, it’s super sensitive too, so you’ll be able to interact with the display while having gloves on. Topping things, it’s soundly protected by Gorilla Glass 3, which should no doubt give it plenty of protection. As a whole, though, we feel that Nokia could’ve upped the ante somehow, but then again, there are still limitations seen with Windows Phone 8 when it comes to screen resolutions. It’s not Nokia’s fault, but rather, it’s an operating system limitation that’s preventing this one for making the jump up. Regardless of that, the display complements the handset’s striking design. 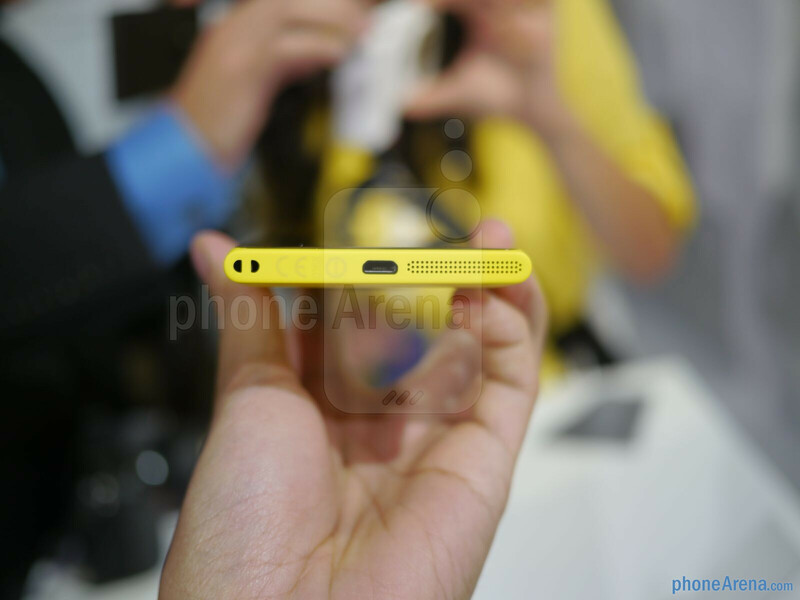 The Nokia Lumia 1020 features a 4.5-inch 768 x 1280 (WXGA) PureMotion HD+ panel with Gorilla Glass 3. Whereas we were expecting something more with its display, we didn’t think that Nokia would stray from the design language of its previous Lumia devices. Frankly, we’re astounded the most to find that this beefy camera packing smartphone doesn’t blow up in size, because really, we were thinking it was going to go in the complete opposite direction by being a beastly thing – like the chunky PureView 808. 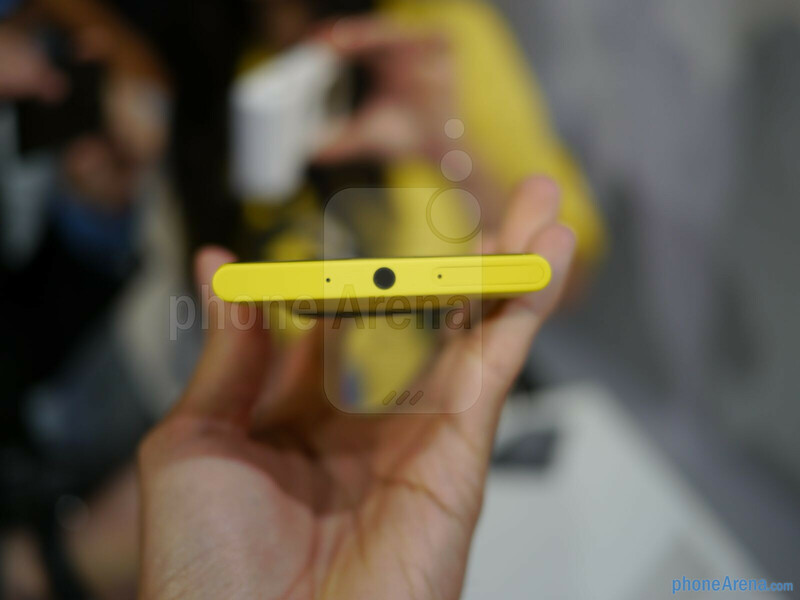 Although it’s nowhere as insanely thin as other flagship devices, the 10.4mm thickness of the Lumia 1020 is indeed surprising. Holding it, our hands are able to comfortably wrap around its unibody polycarbonate frame, seeing its sides are rounded and hug our hands perfectly. As always, the construction with this is fantastic too, as the combination between its sturdy feel and weight gives it an overall solid quality. Despite our admiration, the design could’ve been treated to something more too – like that aluminum frame found with the Lumia 925. Nevertheless, people will appreciate that this is going to be available in black, white, and yellow. The latter of the three colors, of course, is probably the most polarizing of the bunch, but it would’ve been better if it received the same color options as the Lumia 920. 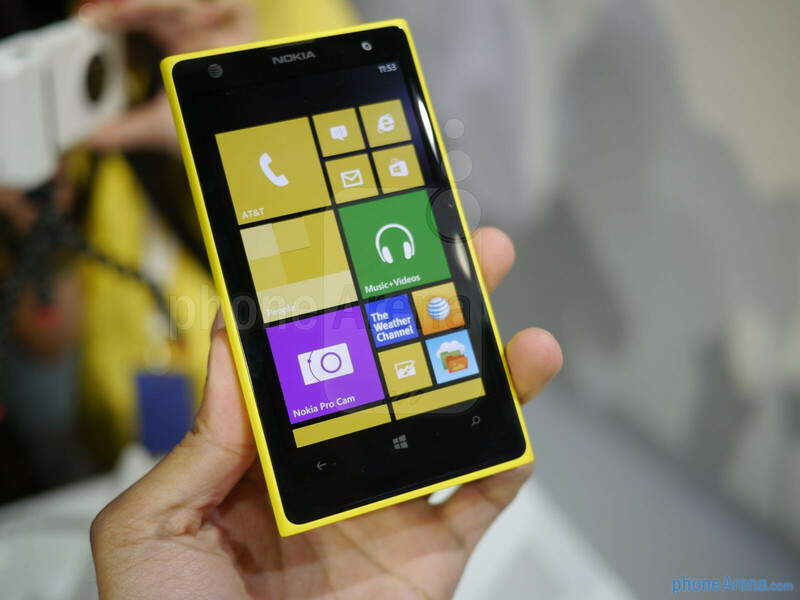 It has that classic Lumia design. Checking out every little inch of real estate on the handset, it’s packing all the same buttons and ports found with other Lumia smartphones. On the right edge, all of its physical buttons line up squarely together – and they’re all distinct to the touch and offer tactile responses. These include the power button, volume control, and two-level shutter key. As for the rest, it features a 3.5mm headset jack, noise-cancelling mic, microUSB port for charging/data connectivity, and SIM slot. 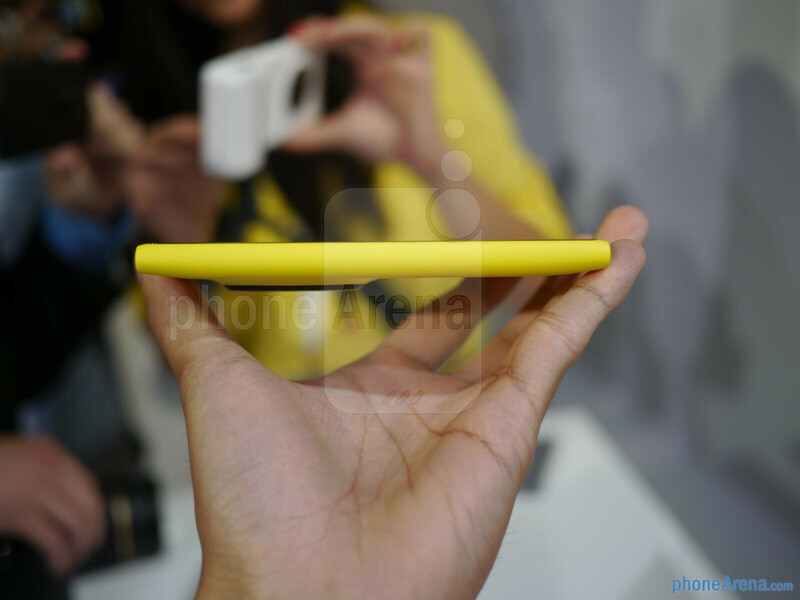 Flip it over to its back side, we’re greeted to the handset’s main attraction – its 41-megapixel PureView camera. True, a lot of its notoriety is probably attributed to the 808 PureView, but there are even more high-tech goodness packed into this camera. 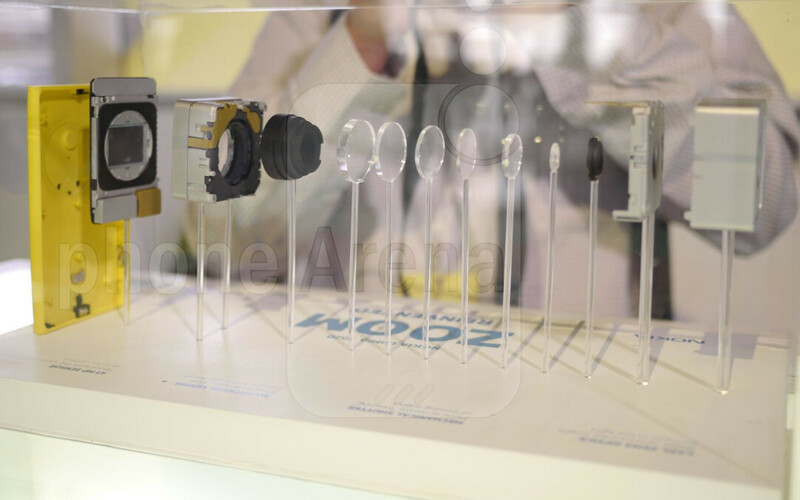 Specifically, it features a backside illuminated 1/1.2” sensor, 3x lossless zoom, six-element lens with ZEISS optics, LED & Xenon flashes, and a second-gen optical image stabilization suspension. Needless to say, it’s an extensive set for any smartphone, but we’re still curious to see how it fares – we’ll talk more about our initial impressions later. In order to have a camera of this caliber, the compromise is made in that it produces a noticeable hump to the frame of the handset. It’s not terrible, seriously, but it’s nice to find that there’s a cover over the lens to protect it – albeit, it opens up when the camera app is launched. im a gamer myself and the camera is literally the 1st thing i look at. then processor speed. i'd look into sensors also and the actual software used to "fix" the photos. It's important to actually qualify yourself in the best camera/smartphone. Do you take a lot of night shots? Fast motion? Landscapes? Food/Macro? S4 is awesome for outdoor shots with great sunlight and macro shots. I'll take the HTC one for fast motion and low light. Uh no. Contrary to what you might think, but most users of high end smartphones look for the display/resolution as a bigger and more practical priority than any sort of inclination to indulge in a megapixel hunt-fest. You'll be staring at your smartphone's screen most of the time—thus a display res matters. As well as the performance. However, the camera can't ever be used as much, unless of course you capture footage with your phone 24/7. the reason i didnt name the reso. was because the chances for a "high end" device coming out without at least a 720p screen are slim. that being said performance and camera tech are first and foremost . Your niece is a he?! Awkward. No no...his nephew is a she. Camera is always the first thing i look at in a phone, because i use it a lot, but maybe i will wait for the successor of this phone. I mean, the sensor is 1/1.5, i wished it is the same as the 808. Not a big difference, but i'd like a bump up in specs, no point replacing my 920 with this one. 2Gb of RAM is nice though. i was going to get this instead of the Gs4 just to try it out. but after thinking im gonna do the same i know the Snapdragon s4 isnt the best they can do and maybe an even bigger sensor then that of the 808? as a manufacturer wouldnt it just want to improve past the original ? 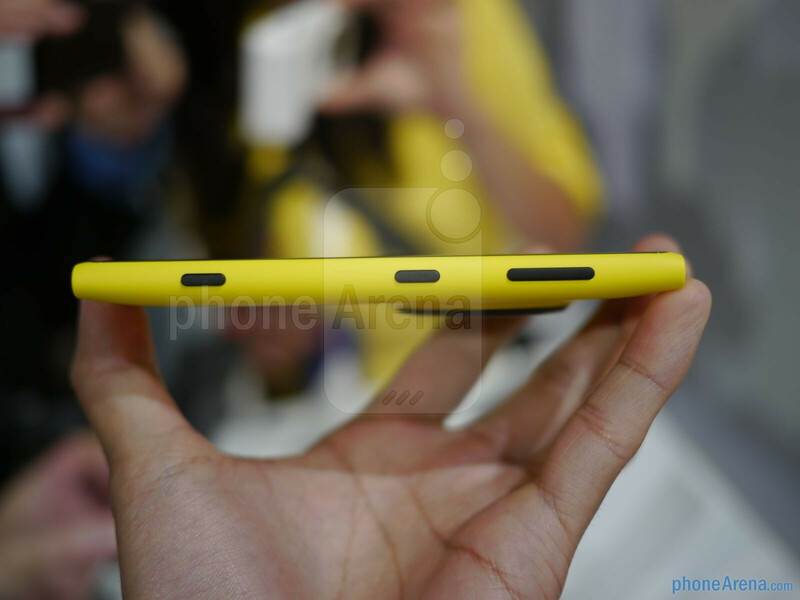 The larger sensor on the 808 would've required a thicker profile on the Lumia...which was a no go given the physical parameters set forth in the original design objectives. It's a smaller 1/1.5 BSI vs the 808's 1/1.2...but it's still enormous for a smartphone and benefitting from BSI...which is not present on the 808 sensor. The overall sensor size, coupled with large aperature, latest gen optics, and second gen Nokia 3 axis OIS will make this the best low light shooter on the market, by far. shut the hole samsung troll. You have nothing interesting to say what for coming here? This phone ain't cutting edge, it's from last year. 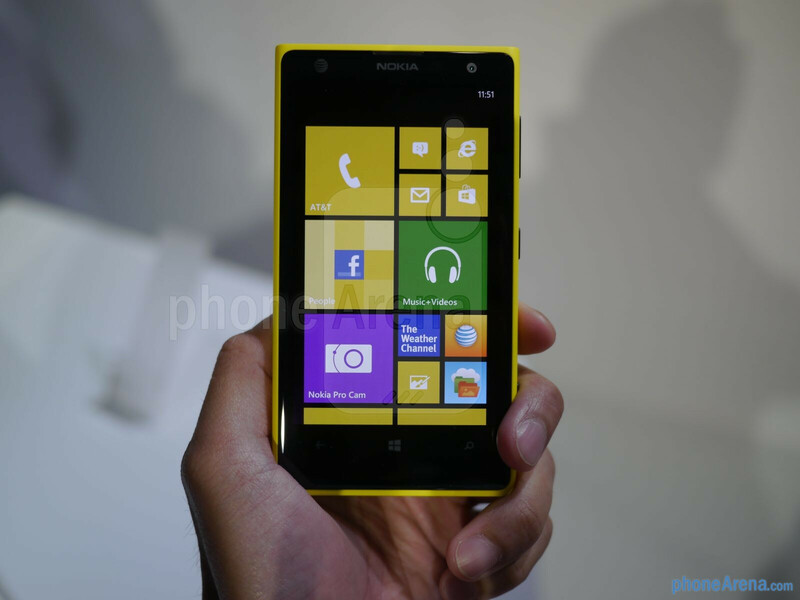 This is what the lumia 920 should have been, and what people expected to be. If they pulled this out last year, then it would have been very good for them. Camera isn't everything, because look how many 808s have been sold. Also, your niece who is a he wants a smartphone with an excellent camera? I have not been a fan of the Lumia series neither do i believe that camera makes or breaks the deal with smartphones but thats just me. I marvel and admire Nokia's engineering with the Lumia 1020. To say that point and shoot are worth more than this is a pretty lame thought considering that one doesn't carry their point n shoots in their pockets everyday. Photography is about moments and portable alongwith power of the Lumia 1020 gets a biiiiiiig thumbs up from me. Why? and simply look at prepaid like virgin or boost. and what refusal do you need besides there being no windows phone on their line up? Dear FlushBordom, the Lumia 1020 doesn't offer just a great cam: it offers the very best camera unit that is currently available in a single smartphone device. It also offers quality dual HAAC microphones for recording audio, and stereo speakers for playback. The internals are certainly not "outdated", and while higher resolution displays do exist for some Android devices, the lack of 1080P or a Snapdragon 800 CPU is certainly not a deal breaker in my opinion. It has 2GB of system RAM, and ships with either 32GB or 64GB internal storage memory. It runs on WP8 OS, which some people hate, but which is generally quite fast and secure, and the platform now has a growing number of apps and games that make it more accomodating than before. The device weighs about the same or less than the Galaxy Note II, and comes in a Polycarbonate shell that ships with black, white, or yellow for coloring. Is this device going to replace a DSLR camera? No! However, for those who want to discard a point and shoot compact camera, the Lumia 1020 offers good enough performance to avoid making any major compromises when it comes to basic photography. No other smartphone devices that currently exist on the market can offer the same option without making significant sacrifices in picture and/or video quality, which is why the Lumia 1020 is worth it's selling price. If you don't care about the quality of your photos/video/audio, then stick with something else, okay? You just massively contradicted yourself. Earlier u said "EXACTLY...camera is everything, ditto megapixels I can live with a 420p resolution and a 3 year old cpu/gpu for as long as it has a great camera with ginormous megapixels" and now u say something completely different. What does that say about your credibility? Mini-review Pro's 1. It has the best camera in a smartphone Con's 1. It's basically a Nokia 920 (no improvement if you use it as a smartphone) 2. Carrier exclusivity (Doesn't matter if it's released a few months later on other carriers; it's old out the gate) 3. $300 price on contract (Your paying $200 to $300 to say you have the best smartphone camera (I've seen the Nokia 920 free on contract) 4. $80 camera accessory. (It's just a spare battery case with button.) Why not just buy a dedicated camera if you want to lug an accessory around? Mind boggling!!! My god... I've never seen so much trolling... Use a WP8 device and tell me about specs... It's a great device that feels organic.. This is nothing like the robotic feel of your my space ran frisbees... I can't see myself ever going back to android. Why you call trolling people who don't like this limited OS ? It's not accidentally everyone don't like this old OS, I read reviews, I have tried it, and I know how limited this software is. It's not to people to stop bashing this old OS, we don't have nothing to do with that, it's Microsoft to make an effort for this old OS to be better and loved and Nokia to make good choice and listen to customers for their phone to sell. It's not at all people's fault. You will not force people to like something they don't like even calling them trolls. We are in real life. TROLL If you dont like the os why even bother with checking out this phone? This many reactions from fandroids can only mean ýou see something you want but cant have. If you want good pics im sure the gs4 zoom will take good pics for you, but dont come Crying here when it lags to hell on android who btw is way older than wp8. D!ckhead, here it's a hands on, so people must and have all their right to come and see what journalist thinks about the phone before they get their own impression of it. So, it's all legitimate to, after reading the review and the comments, to give my own advice about this hardware and watch the article, and for bad people like you to stop advising incorrectly the ignorant ones. Are you a Nokia marketer ? NO ! So stop saying sh!t and be realist now.